Returning for summer number eight is Jonathan Schack. He’s called several places throughout the midwest home. He was born in the Chicago area, lived in Milwaukee and then St. Louis, and now resides in Columbia, Missouri, where he’s a freshman at the University of Missouri. 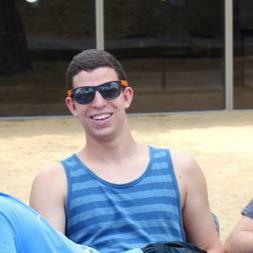 Jonathan is active on campus as he is involved in his fraternity, AEPi. He’s majoring in journalism and hopes to go into film production. Camp is a family thing for Jonathan as his twin brother spent many years as a camper and counselor at North Star. His younger cousin, Daniel Bernstein, is one of our campers. We’re excited to have Jonathan back as a tennis and sailing instructor. This entry was posted in 2013, Staff on April 25, 2013 by Dan Lichtenstein.